A potato dumpling pasta. My brothers John and Luke named these little pasta shapes,sticky macaroni sinkers as kids. They really are a heavy pasta. No one leaves the table feeling hungry. They are worth the extra time to make, and through these generations to our children a well loved pasta in our family. I always called them sticky macaroni. That was what I thought they were, and when they came out great some of them stuck to the roof of our mouth. Rolling them out like ropes and cutting them are so simple. 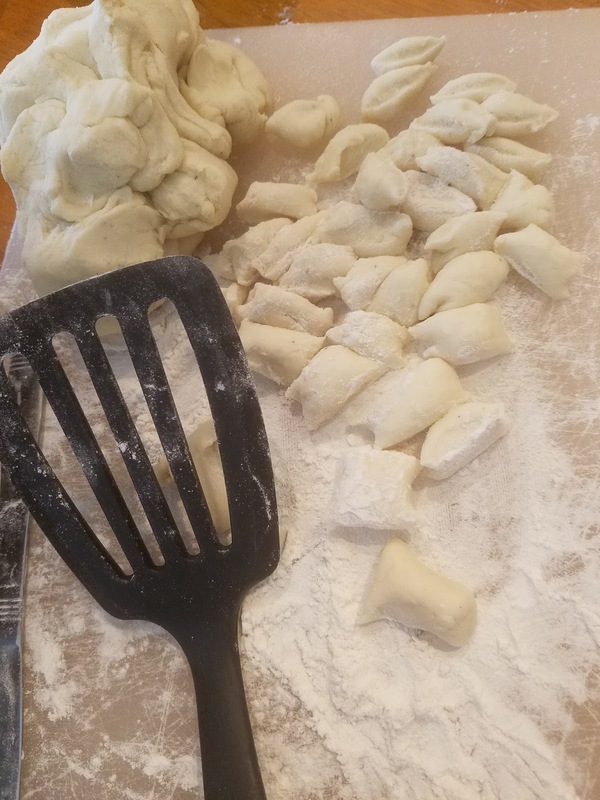 Once you cut the one inch pieces, just take a fork and roll the piece of dough towards you to leave a pocket inside and roll up towards you quickly using lots of flour. It takes a few tries. Then after these are done, add a sheet of wax paper, dust your cookie sheets with flour and cook or freeze them till firm then put into bags. This potato pasta, is my late mom's recipe, Margaret Ann Fanelli Colenzo and Grandma Ferraro Colenzo. They made for many holidays, eventually we all helped out as the families grew larger. This is a favorite in our house and no longer do we wait for holidays. My brothers, John, Luke and their children love these and make them also, the traditions live on.through every generation in our family. We called them the sticky macaroni as kids! You will need a big pot of Traditional Sunday meat sauce and plenty of good grade pecorino romano grating cheese, topping it all off with a good bottle of Chianti, this is a great dish ...... oh and did I mention my very favorite pasta of all time? 4 cups of all purpose flour (more for rolling and adapting to the amount of moisture in the potato, have a 5 lb bag on hand) yukon gold or white creamy potatoes. Mix the potatoes in a large bowl making sure to add more flour if the dough is too sticky. On a large floured board, roll out long ropes. Slice in one inch pieces. With your index and middle finger, roll each piece of dough toward you or use a fork, rolling the dough towards you to make lines. There should be a center that is rolled. Watch video for more instructions. 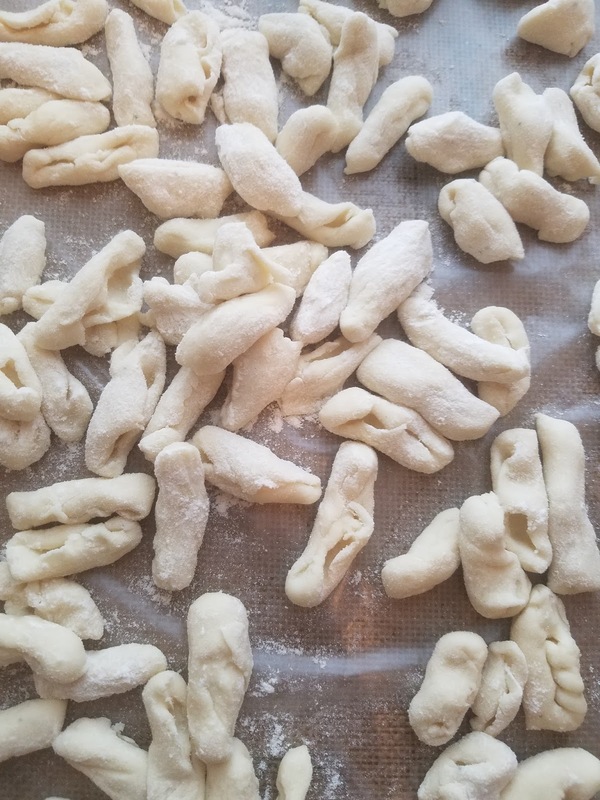 Put rolled gnocchi onto wax paper lined cookie sheets or floured cookie sheets. Keep adding flour to the rolls as you place on the sheets so not to clump them on top of each other or stick. You can stack by layering them with wax paper sheets between them. When the sheet is full freeze them completely, unless you are ready to eat them . When frozen put into bags and refreeze for future use. These don't usually make the freezer, but if you want to make them ahead of time for an occasion they freeze very well. In a big saucepan large enough to house the amount you want to cook, fill pan with water, add a 1/2 teaspoon of salt (or more depending how many you make), when the water comes to a boil add gnocchi, when they float to the top they are done. Top with your favorite sauce and grated cheese. Enjoy! This looks wonderful, Claudia! 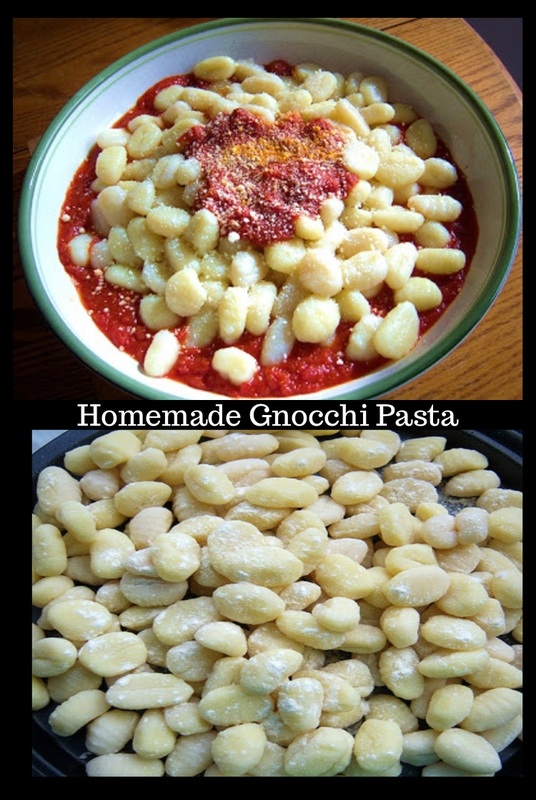 I love gnocchi and watched my mother do this as a young girl. I had to say how wonderful your gnocchi looks...thanks for sharing!